NYC Public School Parents: How DFER and the charter lobby hijacked our politicians, who are allowing them to hijack our public schools in an "inside job"
How DFER and the charter lobby hijacked our politicians, who are allowing them to hijack our public schools in an "inside job"
Today, hundreds of parents and teachers stood in the rain, protesting the first day of Camp Philos conclave, at the aptly named Whiteface Lodge. This shindig was organized by Democrats for Education Reform, with Governor Cuomo the honorary “host” for a meeting of deep-pocketed hedge funders and other financiers who support charter expansion, test based accountability, and other privatization schemes. 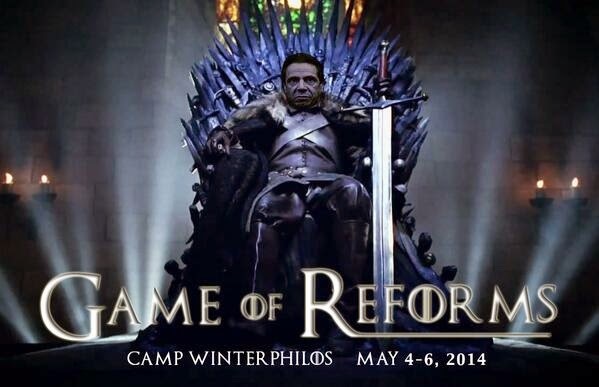 Though at the last minute Cuomo cancelled his plans to attend, presumably because of the protests, several bloggers have written about how ridiculous and insulting is DFER’s spiel, comparing this meeting to the “philosopher’s retreat” that took place in the 19th century between Ralph Waldo Emerson, Russell Lowell, and Horatio Woodman. While the website says that the nation’s “thought leaders in education reform” will be there, instead they cite M. Night Shmayalan, movie director, and others of a less luminary stature. Check out the inspired critiques of Prof. Daniel Katz and teacher Patrick Walsh. The schedule for the gathering features panels with absurd names like “Rocketships, Klingons and Tribbles: Charters' Course to Where No Schools Have Gone Before” and “Adequacy, Fairness and Equity: School Finance in the Age of Austerity” – a fitting discussion since Gov. Cuomo has made sure that NY public school funding is neither adequate nor equitable, and is instead steering more funds into the charter schools backed by his hedge fund contributors. In the latest state budget, Cuomo engineered one of the biggest corporate giveaways in history – to require NYC provide free public space to all new or expanded charters going forward or pay for their private space. This is despite the fact that NYC already has the most overcrowded schools in the state – and the most expensive real estate. No doubt Cuomo’s generosity on their behalf (while making NYC taxpayers foot the bill) and his willingness to host this shindig was influenced by the fact that DFER has given him at least $65,000 since 2010. DFER board members have also given him another $100,000, including those who also serve on charter boards like Success Academy, which will profit the most from the new law. Mayor de Blasio was re-elected overwhelmingly on the need for a moratorium on co-locations and charging charter schools rent. But when he reversed three of the decisions pushed through in the last months of the Bloomberg administration, to give Success Academy free space in already public school overcrowded buildings – decisions made by Deputy Marc Sternberg just weeks before he left to work for the Walton Foundation, which helps fund these charters, the charter lobby went mad. Then, the Walton Foundation as well as some of these same hedgefunders helped pay for a $5 million ad campaign to push them through. Because of the new law, the DOE is now being forced to rent three parochial schools for Success Academy charters, and pay for renovations to suit the specifications of their CEO, Eva Moskowitz. Yet the Success chain has more than $30 million in assets and raised more than $7.5 million in one night a couple of weeks ago, with headliners like Jeb Bush and Campbell Brown, and lots of Wall Street financiers like Dan Loeb, as well as Erik Prince, the disgraced former owner of the mercenary company Blackwater in attendance. How did this happen? How did our electeds of both parties enable corporate interests to hijack our public schools? Today, in honor of the Camp Philos conclave, a new website was born called Democrats in Name only For Education Reform, outlining all the connections between DFER and various right-wing and Republican groups such as the organizations run by the Koch brothers and Betsy Devos. The truth, though, is that DFER has been amazingly successful in hijacking Democratic Party officials as well, through an “inside job”, as DFER founder and hedgefunder Whitney Tilson put it. So this is how we got here. A small band of Wall St. billionaires decided to convert the Democratic party to the Republican party, at least on education -- and succeeded beyond their wildest dreams – or our worst nightmares. And now we have electeds of both parties who are intent on helping them engineer a hostile takeover of our public schools, which has nothing to do with parent choice but the choice of these plutocrats. Their plans to do will be facilitated in NYC, unless this depraved law requiring the inequitable giveaway of public space to charters is overturned. Excellent article! Thank you for exposing DFER and that Republicans and Democrats are the same party regarding education. What a sham...shame for students, teachers and schools and when are parents going to wake up!